One of the biggest roadblocks that corporate innovators face when they're looking to set up a partnership with a startup is resistance from management, which, by design, is set to protect the status quo. Their resistance is not unreasonable — startup partnerships can be tricky for corporations to navigate. For one, there's the question of compliance—especially in regulated environments where enterprise leaders are more visible than their startup counterparts, how can innovation leaders ensure that they're taking their safest steps forward? And then there's the question of risk—how does an immediate-term partnership support the company's long-term business vision? How can companies encourage innovation while keeping core business initiatives profitable? How can team members keep morale high when confronting the risks of an early-stage venture? These questions are often enough to squash ideas before they have a chance to materialize into experiments as managers don't feel equipped to wrangle the short-term risks of long-term R&D. Launch a landing page that tests a value prop for a new product line. Run a survey among audiences in your target customer group. Gather feedback around a UX prototype or mock-up. The bottom line is to get creative with your data gathering, especially if you are working with little to no budget. Use both qualitative and quantitative methods to piece together your business story—you can even ask potential startup partners to share their own case studies with customers that are similar to your business. Always come to management discussions with relevant, tangible pointers. Aim to connect the dots between your business now and in the future. It's common for corporate innovation initiatives to get stuck in perpetual planning mode. Even when teams want to execute, they often need to seek approvals from cross-functional stakeholders including compliance, product development, legal, PR, marketing, and more. One way to eliminate the risk of an endless feedback cycle that stalls innovation is to identify a potential pilot—a clear project with a well-defined timeline, set of milestones, and end deliverables. Focus on low-hanging fruit that supports your business outcomes. Reach out to potential partners with a tangible plan. Co-create a proof of concept and requirements list. Set goals and timeframes. Be concrete and goal-oriented in your plans from day one. Be willing to take risks. Your project won't fall apart if your team needs to change directions. Remember that startups thrive on uncertainty and ambiguity. Make experimentation, and trial and error an early priority. A successful pilot can help you gather data, validate your ideas, and get your products in the hands of customers for direct feedback, faster. 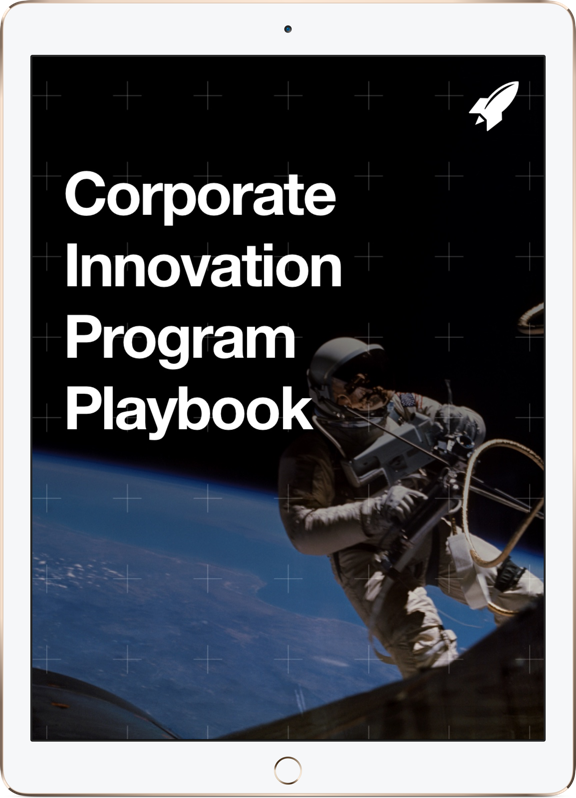 Plus, your pilot can help you get your corporate innovation project off the ground. In the corporate innovation world, successes aren't always straightforward to measure. Long-term ROI can take years to materialize. Projects, beginning as early-stage experiments, will likely fail multiple times before they become successful. While managers within startups have the flexibility to take these risks, their enterprise counterparts are often gridlocked. So how can managers hedge their bets in minimizing uncertainties? The simple answer: don't worry about hedging your bets. Instead, redefine your view of success. Remember that failure has the potential to be a positive outcome for your company. Let's say that you're testing a partnership with a startup to help validate a new product idea that you're developing. Three months into the relationship, you realize that that your assumptions were incorrect and the idea is a mismatch for your customer base. You pivot your customer base, and nothing works. You change your value proposition, and still nothing works. In this particular example, failure would have been a success for your company. By identifying dead ends, you can course-correct more quickly. Ultimately, the success metrics that you choose will depend on your team, company, partner, and project. This guide on The 5 Traits of High-Performance Corporate Innovation Teams from RocketSpace's SVP can help you build the right path for you. Want to learn more about how to convince your management team to support a startup partnership? Check out our Startup Engagement Program and how we help corporates establish the best-in-class startup partnerships.